Don't tell my wife about this blogpost, she would not like anyone knowing of her guiltiest culinary pleasure! It was her that turned me on to this delectable dish. I'm really scraping the bottom of the can here -- so, let's keep this Beanie Weenie recipe between you and me. 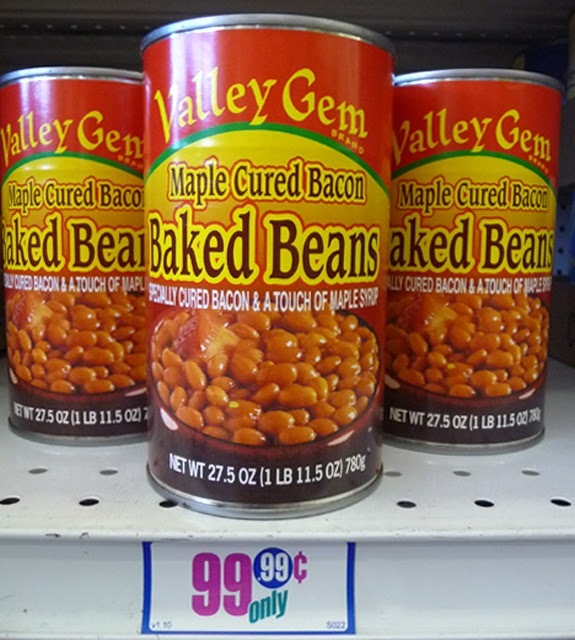 I can imagine Amy in her bachelorette days, with another magazine article deadline looming, and no time to hit the market to select fresh veggies for a nutritious salad -- and as a last resort, rummaging through the cupboard for a can of baked beans. Then sighing in relief, when she finds a few wieners left in a package of hot dogs, in the back of the refrigerator. Deadlines call for desperate measures. Don't look down your noses, now -- hey, I've tried it and it's freaking good! This is cupboard cuisine at its cheapest and quickest. 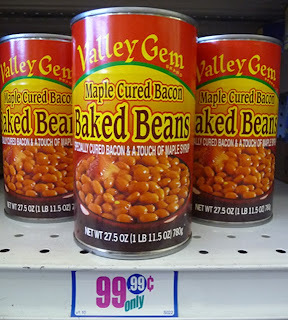 A similar recipe brought from England (beans with bacon) kept the early Colonialists fed through bitterly cold winters. New Englanders soon started adding maple sugar, or molasses, to create the classic Boston Baked Beans used in this recipe (read all about the origins here.) So, you will be honoring our Colonial ancestors by trying The Chintzy Chef's lasted budget entree! Back when my wife introduced me to her secret cravings, hot dogs were a traditional mix of pork and beef. 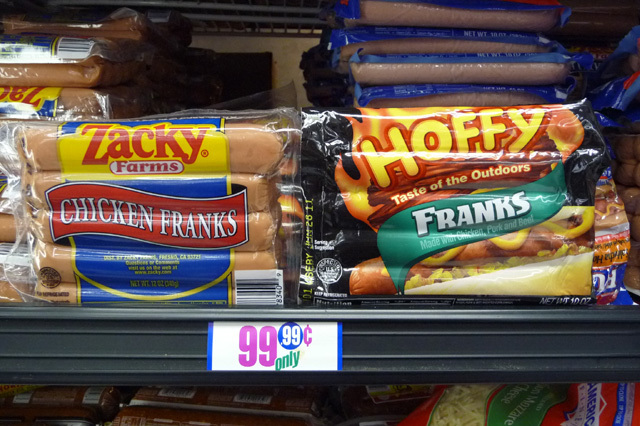 Now you can get "natural," kosher, or nitrate and hormone free wieners. You can kick this recipe up a notch by substituting fresh ground, and encased, sausages from your local deli or specialty market. 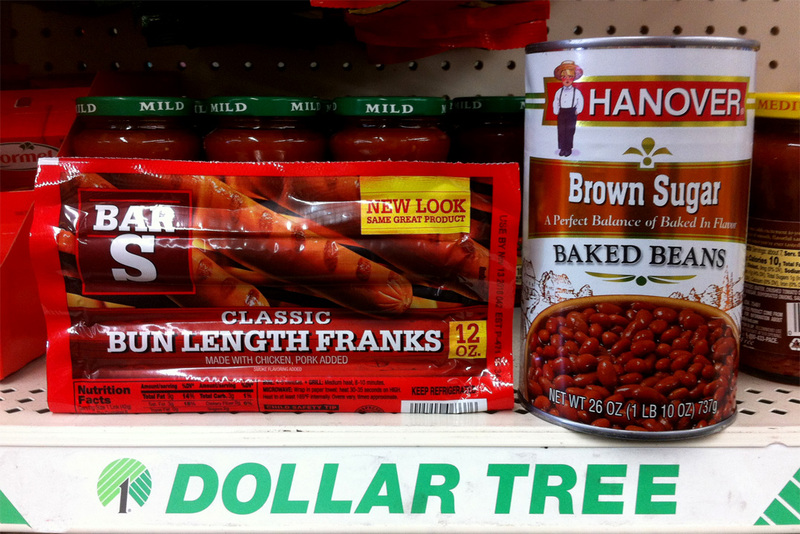 As for canned baked beans, your selection is somewhat limited. I've found Bush's Baked Beans a good brand, while the British swear by Heinz (funny video of two English blokes fixing them on toast for breakfast here.) If you have a favorite, use it. For this recipe, in keeping with my blog theme, I used an off brand bought cheaply at my local 99c Only Store. Homemade Boston Baked Beans are on my to-do list, I'm just waiting until it gets cold enough for this slow baking oven recipe, so do check back for that. Just watch the video below to see how fast a plate of sweetened legumes with frankfurters can disappear. The video takes you through the making and consuming of my Beanie Weenie recipe, using an animation technique called "stop motion." You've seen it before, popularized through the Gumby and Pokey TV show for children; or my favorite claymation movies featuring Wallace and Gromit. In the original 1933 King Kong movie, the giant ape was really just a foot high model. Click on the following animators to view visually baroque uses of stop motion from international film festival favorites the Quay Brothers and Jan Svankmajer. And, the most outrageous use of stop motion is in my "Chasing Sea Urchin" video, where I duke it out with a live sea urchin on an air hockey table! Click here to see it -- stop motion starts at 2 minutes and 20 seconds. So, if you are under the gun and need a quick protein and carb-loaded boost, you could do worse than my wife's Beanie Weenies recipe. Do you have a quick and cheap guilty pleasure? Leave a comment describing it, so I don't feel so bad divulging a culinary couples' dark secret! Play it here. The video runs 58 seconds. 2 - 4 hotdog wieners - or your favorite sausages. 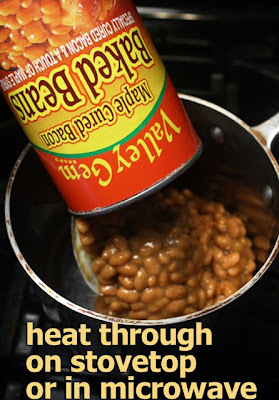 1 can of Baked Beans or Pork n' Beans - I used a 27 ounce can but you can use a smaller one. Beans & Wienies have plenty of salt to my taste, but add a bit of black pepper to taste. Pour beans into a pot to heat through. Add oil to medium heated saute pan. 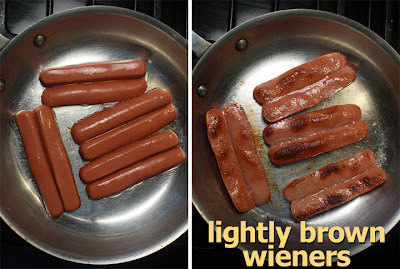 Split hot dogs and cook in pan until browned on each side, about 5 -10 minutes. 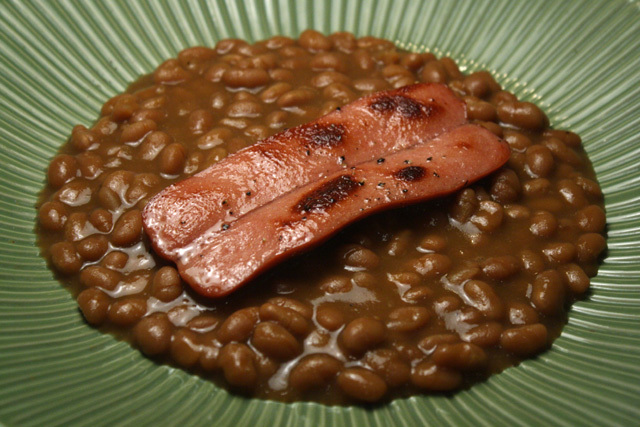 Serve beans on a plate and top with sauteed hot dogs. Drink of choice with this entree is a mug of beer! I live in upstate NY near the VT, MA border. Beenie Weenie's are a staple here in fall and winter. We slice our dogs into coin shapes and brown them with onions before adding to the beans. Some folks drizzle on a bit of mustard before eating, some like ketchup, and some BBQ sauce. I've tried all 3 ways and they are all tasty as can be. We saute the hot dogs in butter and add more brown sugar and ketchup to the beans . Cook until the sugars caramelize . YUM !! The Chef continues to take the "haute" out of haute cuisine! Well, Denise in this case I'm taking the haute out of dogs! My family loves Beanie Weenies! Inexpensive and filling, high in protein. Add a veggie or two and a canned fruit and you have a great meal. I just found your blog. Do you have a spot for your readers to share their inexpensive meal ideas? hi armygirlvet, welcome to my blog -- I guess I need to add a guest recipe page? Well, you can always leave a cheapie recipe comment sometime. When the house is empty and I want to snack on a hearty pleasure from the days when scraping up 99 cents for a meal was a sacrifice I throw together and old stand by-eggs and crackers. Simply beat two eggs, add four or five coursely crushed saltines and scramble. A bit of sautéed onion in the mix is an added treat. Pilfered packets of saltines have a purpose.